This function is optional and is not active in the standard set of the server functions. To activate the function, you need additional equipment and licensing. Step 1. Connect the external GPI module to the free USB port of the server system block. Installation of drivers is not required, after the end of initialization, the indicator Status at the USB-module should change its color from red to green. Step 2. Choose the item Configure Server Components at the icon SL NEO Mediaserver in tray (server software should be preliminary stopped by the command Stop Server). Find the field Available components in the setting window and add the element ONTRACK ADU 2X8 to the right field. Step 3. Launch server software (right click on the icon SL NEO Mediaserver in tray). Further settings will be implemented from the control panel - Administrator Control Panel. Login to the console is implemented locally from the server, or from any machine in the network by the address http://ip address:7901. You should login as an administrator. After the entry to the control console: choose Manage in the left menu, then choose the tab GPI Boards and click Service Enable in the window GPI Board 1. In the field Enter Serial Number enter the serial number of the USB-module (see at the front panel of the module). To save the configuration, click Apply Changes at the top part of the control console window. You can check the module workability in the tab Status from the left menu of the control console. Click Action in the window GPI Board_1, choose Action - Set Pin in the opened window. In the field Param 1 choose the number of the relay output of the module (the value У1Ф for the port K0), click "ON" in the field Param 2. By pressing OK the relay of the channel #1 (K0 on the module) will trigger and close the contacts. Now, to configure any certain action, you should create a rule (Action). An example: adjustment of rules for managing playout from external GPI commands. The receiver of GPI-commands is triggering after energizing the TTL level to the corresponding input of the USB-module PA 0...3 or PB 0...3. To provide triggering by the button with the so-called Уdry contactsФ, you should implement connections according to the scheme described at the picture. The procedure of configuring server software is implemented from the control web console: menu item Manage, tab GPI Boards. 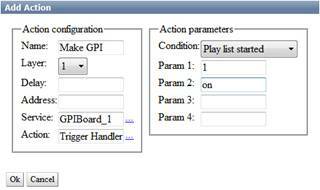 Choose Add Action in the field GPI input actions. In the opened window, enter a random name for the rule into the field Name, choose У1Ф (the sequence number of the input control port) in the field Pin. Set the trigger in the field Value as ON, specify the server IP address in the field Address, or leave the field empty if the value is localhost. The system of rules and commands (Action) of the SL NEO media-platform allows the user to form a command in one server module and send it to another one. By the button ... in the field Service choose the name of the server module, which will receive the command. In our example, it is the service for managing the playout channel #1 (Program_1 on the list). Then use the same scheme to stop playback by the command STOP. You can create similar rules for turning on/off the logo, changeover to the next event in the playlist, etc. To save the configuration, click Apply Changes at the top part of the control console window. The procedure of configuring relay GPI-outputs for the ONTRAK USB-module is completely identical to the procedure described in the section Configuring the GPI Option (ADLINK PCI board). Adjustment is implemented from the control web console: menu item Manage, tab Program Outputs. Variant #1 - generation of the GPI-command with every start of the playlist, with using General events, without binding to a certain playlist line. Find the tab Actions in the chosen program channel, choose the tab General Events. Unlike the tab Playlist events, in the tab General events you can set the general conditions for forming commands, without binding to specific playlist lines. In the tab General events choose Add Action. 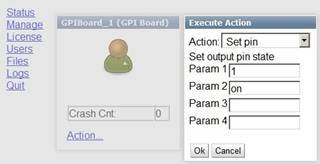 In the opened window enter the parameters of a new rule for forming the GPI command. In the window Action Configuration, enter a random name for the rule into the field Name, choose У1Ф (the main fullscreen playlist layer, controlling generation of the command) in the field Layer. Specify the server IP address in the field Address, or leave the field empty if the value is localhost. In the field Delay you may set the delay for triggering in milliseconds. In the field Service press the button Е and choose from the list the name of the service for managing. In our example it's the control service for the GPI device (GPI Board_1 on the list). In the window Action choose Trigger Handler - the trigger that will launch on a certain condition. 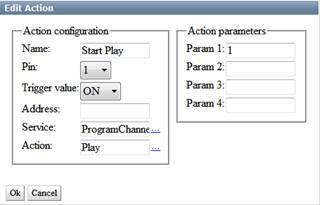 Find the field Condition in the window Action parameters and choose Play List Started - the rule for launching the trigger. In the field Param 1 specify the pin number (the physical output of the GPI device) and the position, to which it should be switched: on/off (place the mouse cursor to an empty field and see the hint). You can use the same scheme to create a rule for generating the GPI-command in case of the playlist stop. Variant #2 - generation of the GPI-command with using Playlist events, with the tie-in of a formed command to a certain playlist line. The rule will read off the mark from a certain column of the playlist line, and form the command for generating the GPI-command. For configuring, you should choose the item Actions in the corresponding window of the service Program Output, then find the tab Playlist Events and choose Add Action. In the field Name of the window Action Configuration specify the random name for a new rule, in the field Layer choose "1" (the main fullscreen layer of the playlist, that controls forming the command). In the field Delay enter the value of delay from the start of the on-air event till the generation of command, in milliseconds. You may use the same value for generating the GPI-command before the event end and setting the time interval from GPI triggering to the event end. In the field Address set the IP address of the server, or leave the field empty, if the value is localhost. In the field Service press the button Е and choose from the list the name of the service for managing. In our example it's the control service for the GPI device (GPI Board_1 on the list). In the field Action condition, find the field Variable and specify the playlist column that will contain the mark. For the example we choose GPI1 mode. Set the trigger as EQUAL, enter УonФ in the field Value - the rule will trigger, if the command УonФ will be chosen in the field GPI1 of the playlist line. If you want a GPI command to appear certain time before the end of the on-air event, choose the item Trigger at end when primary matches. This item is available in SL NEO software versions 1.6.50 and higher. 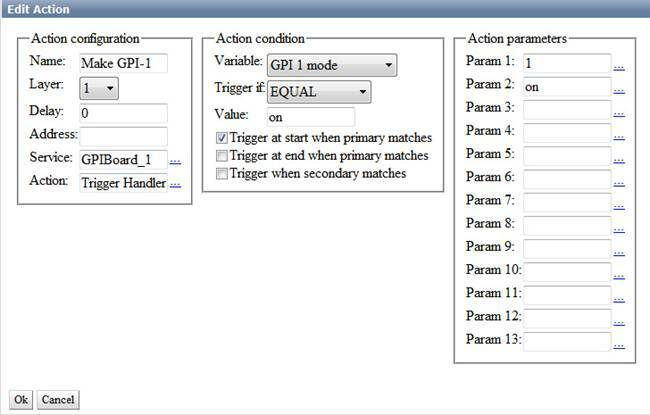 In the field Param 1 of the section Action Parameters specify the pin number (the physical output of the GPI device) and the position, to which it should be switched: on/off (place the mouse cursor to an empty field and see the hint). To save the configuration, click Apply Changes at the top part of the control console window. Herewith, the playout channel with the changed configuration will be reloaded, playback of the current channel will be stopped while reloading.